In every corner of the D.C. area, there's a fireworks display ready to light up your Fourth of July -- but first you have to find one near you (and that's where this list comes in). In the District, the National Mall is the star, with A Capitol Fourth bringing swarms of locals and tourists alike for a grand Independence Day party. Fireworks burst from the Reflecting Pool and bathe the surrounding monuments in colorful light, but this year's event also features music from Frankie Valli, Jordin Sparks, Patti Labelle and The National Symphony orchestra, with Tom Bergeron hosting. The concert is held on the West Lawn of the U.S. Capitol and begins at 8 p.m. Gates open at 3 p.m. and guests are advised to arrive early -- you might have to camp out for a good seat. If you don't want to brave the throng of bodies on the mall, check out our interactive map of fireworks fun all throughout the region (red pins denote events that fall on July 4; different colored pins mark fireworks on other days). Then scroll down for more details. Meridian Hill Park: The fountains that cascade down the park's tiered landscape reflect the flashes in the sky anove the National Mall a couple miles to the south, and the relative elevation of the area makes for a great viewing spot. The SkyDome Lounge at DoubleTree by Hilton, Crystal City: The revolving restaurant 15 stories high, and across the Potomac, should offer a panorama of the night's light show. Gravelly Point Park: Uniquely situated directly across the Potomac and next to Ronald Reagan Washington National Airport, this area is popular with plane watchers, but should provide a great vantage point for the fireworks. DNV Rooftop lounge: A kickoff party July 3 at the Donovan House Hotel will take over their newly renovated rooftop on the 14th floor, featuring patriotic drink specials; the bar opens at 4 p.m. Then, on the Fourth, the bar will open at noon, but if you go late, you can skip the Mall crowds and watch the fireworks via a big screen instead (and enjoy a cocktail or a red, white and blue boozy pop). If you're not feeling the downtown scene, read on to see all the places to find firework fun in neighborhoods throughout Maryland and Virginia. Celebrate the Fourth in Annapolis with an old-fashioned community parade featuring a performance by the U.S. Naval Academy band at Susan Campbell Park (1 Dock St.). Concert6:30 p.m.; fireworks 8 p.m. Enjoy the best of downtown Baltimore on the Fourth with live music by Electric Brigade and other performers followed by fireworks over the Inner Harbor. Music 7 p.m.; fireworks 9:30 p.m.
Can't wait until the Fourth? Enjoy an all-American evening filled with hot dogs, baseball and fireworks July 3. Watch the Baysox take on the Altoona Curve and then stick around for a fireworks display on the Prince George's Stadium field (4101 Crain Highway). $7-15; free for kids 2 and younger. Game: 6:35 p.m. Enjoy live entertainment beginning at 7 p.m. with fireworks at 9:15 on the campus of the University of Maryland in College Park. Food vendors set up shop starting at 5 p.m. -- you'll find burgers, hot dogs, funnel cakes and other festival must-eats. Free; music 7 p.m.; fireworks 9:15 p.m.
Watch fireworks over the water at Chesapeake Beach (8200 Bayside Road) on July 3. Grab a spot to enjoy the show over the bay. Fireworks 9:20 p.m. Celebrate Independence Day in Howard County with entertainment on two stages, food vendors and family activities at the Columbia Lakefront (10221 Wincopin Circle). Music 5 p.m.; fireworks at dusk. Appreciate fireworks against the beauty of nature in Deep Creek and see the annual Fire on the Mountain Fireworks Display at Wisp Resort (296 Marsh Hill Road). Fireworks 9:30 p.m.
Greenbelt residents can expect July Fourth Fanfare at Buddy Attick Lake Park (555 Crescent Road). The event begins with a drum circle, continues with the Greenbelt Concert Band and ends with a fireworks show (naturally). Drum circle 5:30 p.m.; band 7:30 p.m.; fireworks 9 p.m.
Just because it's a little late doesn't mean your celebration has to be over. Head to Laurel on July 5 for a day featuring a parade, hot dog-eating contest, fireworks and more. Parade 11 a.m.; fireworks 9:15 p.m. Celebrate on the beach and enjoy a concert followed by fireworks. NOTE: The possibility of wet weather and strong winds has forced officials to reschedule Fourth of July celebrations to July 5. Times for both events will remain the same despite the date change. Concert 8 p.m.; fireworks at dark. The Mayor and Council of Rockville will host Independence Day celebrations at Montgomery College-Rockville Campus (51 Mannakee Street) with music and, of course, a fireworks show. Entertainment 7 p.m.; fireworks 9:15 p.m. Spend July 4 in the charming fishing village of Solomon Island, where you'll find a fireworks show above the Patuxent River. Fireworks 9:15 p.m. The 125th annual Fourth of July celebration at Takoma Park Middle School (7611 Piney Branch Road) will feature a parade, music and other performances. Fireworks 9:30 p.m.
UPDATE: Joint Base Myer-Henderson Hall will no longer be open to the public for fireworks viewing. It is now restricted land owned by the U.S. Army. Enjoy the sounds of the United States Air Force Band and the sights of fireworks behind the backdrop of the Air Force Memorial (1 Air Force Memorial Drive). Concert 8 p.m. It's a joint birthday party for Alexandria and America on Saturday, July 12 at Oronoco Bay Park (100 Madison St.). Catch a concert by the Alexandria Symphony orchestra and a fireworks display. Plus, there will be plenty of birthday cake to go around. Concert 9 p.m.; fireworks 9:30 p.m.
Join the city of Falls Church for an Independence Day party complete with live music and fireworks at George Mason High School (7124 Leesburg Pike). Concert 7 p.m.; fireworks 9:20 p.m. The town of Herndon rings in America's birthday with a night packed with patriotism featuring games, face painting, bingo, live music and, of course, a fireworks show at Bready Park (814 Ferndale Ave.). Games and crafts 6:30 p.m.; concert 7 p.m.; fireworks 9:30 p.m. 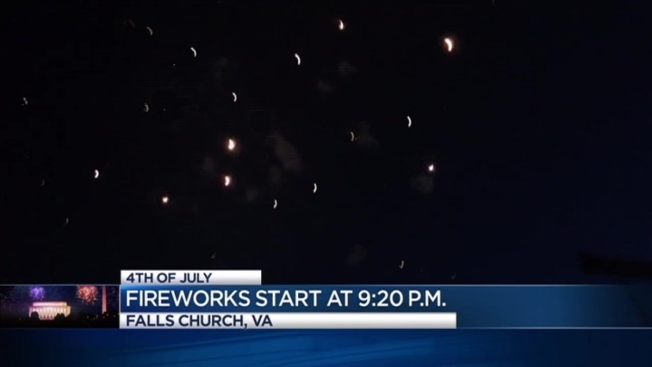 Throw it back with an '80s themed July 4 in Leesburg. From a morning parade to a performance by cover band "The Breakfast Club" to a bangin' fireworks show, there's plenty to do on Independence Day at Ida Lee Park (60 Ida Lee Drive NW). Parade 10 a.m.; concert 6:30 p.m.; fireworks 9:30 p.m. Check out the annual Lovettsville Independence Day Celebration on July 3 at Lovetsville Community Park (E. Broad Way). Described as a "real hometown, community" event, join in the traditions that have been around since 1976. Parade 6 p.m.; pool party 6:45 p.m.; fireworks 9:15 p.m. Celebrate July 4 with an all-American party in downtown Manassas featuring rides for kids, food vendors, live music and a fireworks display on the Historic Manassas Museum lawn (9101 Prince William St.). Rides 3 p.m.; food 4 p.m.; concert 7 p.m.; fireworks 9:15 p.m. Spark up the holiday with McLean's fireworks show at Langley High School (6520 Georgetown Pike). Shuttle buses will be available from St. John’s Lutheran Church (on Douglass St. and Georgetown Pike) and the McLean Community Center. Gates open 8 p.m.; fireworks 9:15 p.m.
Why not meet George Washington on the Fourth? His historic estate (3200 Mount Vernon Memorial Highway) will offer activities all day, including a naturalization ceremony for 100 new citizens, military re-enactments, fireworks and more. $15 adults; $7 for kids ages 6-11; free for kids younger than 6: activities 8 a.m.-5 p.m. Stretch out the festivities by celebrating all day at Lake Fairfax Park (1400 Fairfax Drive) in Reston. Spend the day at the park before the nighttime fireworks display and performance by the U.S. Army Field Band. Park opens 7 a.m.; carousel and boat rides 11 a.m.; puppet shows 4 p.m.; fireworks 9:15 p.m.
Vienna hosts an all-day festival on the Fourth, featuring arts and crafts, food, live music, vendors and games at Vienna Community Center (120 Cherry St. SE) Festival 11 am. to 4 p.m..; fireworks 9:15 p.m.
At Colonial Williamsburg, enjoy a reading of the Declaration of Independence, live music and fireworks with a patriotic setting. Music 5:30 p.m.; fireworks 9:20 p.m.